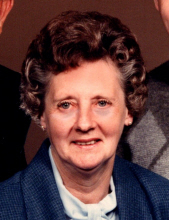 Joann Bowman Goodman, 82, of Flat Rock Road, Lawndale, passed away Sunday, April 14, 2019 at Wendover in Shelby. Born in Cleveland County on May 30, 1936, she was a daughter of the late Hal Matthew Bowman, and Nevia Louise Towery Bowman. She was retired from Drexel Furniture and was a member of Knob Creek United Methodist Church. In addition to her parents she is preceded in death by her husband, Lowell Thomas Goodman; brother, Mike Bowman; and sister, Ruth Lee Bowman. She is survived by her son, Tommy Goodman and wife, Terisa of Lawndale; brother, Jim Bowman, granddaughter, Anna Goodman; and two great grandchildren, Marlee Crisp and Lowla Barfield. The family will receive friends on Wednesday from Noon to 1:00 PM at Stamey-Tysinger Funeral Home, Fallston. The funeral will be held at 1:00 Pm on Wednesday at Stamey-Tysinger Funeral Home Chapel. The burial will follow the service in the Rose Hill Memorial Park, Fallston. Arrangements have been entrusted to Stamey-Tysinger Funeral Home, Fallston. To send flowers or a remembrance gift to the family of Joann Bowman Goodman, please visit our Tribute Store. "Email Address" would like to share the life celebration of Joann Bowman Goodman. Click on the "link" to go to share a favorite memory or leave a condolence message for the family.